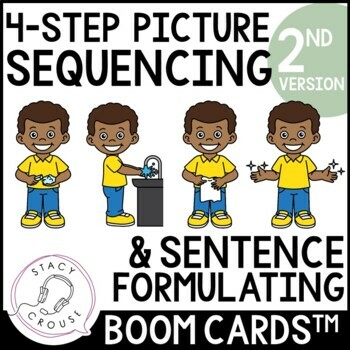 Like original deck, this deck of BOOM CARDS™ contains 70 cards to target sequencing steps and formulating sentences. ★ One "drag and drop" card where the student needs to arrange the pictures in the sequence to the correct order. ★ The next 4 cards have a picture of one step in the sequence (in order) and a fill in the blank for the student to formulate and type a sentence to describe the picture (with help if needed). Boom Cards live in the cloud (therefore, internet/cellular connection is required). They cannot be downloaded or printed. They play on most modern browsers, Android, iPads, iPhones, and Kindle Fires. You open a Boom Learning account to play them (to protect the children). Create Fast Play pins to assign your Boom Cards to students.